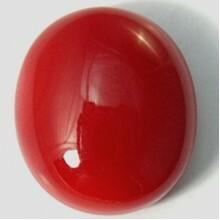 Red coral (Moonga) is gemstone for Mars. Mars is the nearest and hottest planet among all planets in the solar system and it is considered most important as per astrology for its High temperature qualities. It is extremely helpful for people in politics and various official posts. People of Aries (Mesha Rashi) zodiac sign and Scorpion (Vrishchika Rashi) can purchase Red coral to get maximum success. Also, if you require help during ‘Mars period,’ you can wear this gemstone. The main source of Red coral is Italy and Japan Sea. Description Gemstone Name : Natural red coral Number of Pieces: 1 Pc Weight: 2.41 carat Gem Shape: &nbs.. Product Description Gemstone Name : Natural red coral Number of Pieces: 1 Pc Weight: 2.42 carat Gem Shape: o.. Product Description Gemstone Name : Natural red coral Number of Pieces: 1 Pc Weight: 2.44 carat Gem Shape: o.. Product Description Gemstone Name : Natural red coral Number of Pieces: 1 Pc Weight: 2.45 carat Gem Shape: o.. Product Description Gemstone Name : Natural red coral Number of Pieces: 1 Pc Weight: 2.46 carat Gem Shape: o.. Product Description Gemstone Name : Natural red coral Number of Pieces: 1 Pc Weight: 2.49 carat Gem Shape: o.. Description Gemstone Name : Natural red coral Number of Pieces: 1 Pc Weight: 2.50 carat Gem Shape: &nbs.. Product Description Gemstone Name : Natural red coral Number of Pieces: 1 Pc Weight: 2.51 carat Gem Shape: o.. Product Description Gemstone Name : Natural red coral Number of Pieces: 1 Pc Weight: 2.56 carat Gem Shape: o.. Description Gemstone Name : Natural red coral Number of Pieces: 1 Pc Weight: 2.56 carat Gem Shape: &nbs.. Product Description Gemstone Name : Natural red coral Number of Pieces: 1 Pc Weight: 2.57 carat Gem Shape: o.. Product Description Gemstone Name : Natural red coral Number of Pieces: 1 Pc Weight: 2.58 carat Gem Shape: o.. Description Gemstone Name : Natural red coral Number of Pieces: 1 Pc Weight: 2.60 carat Gem Shape: &nbs.. Product Description Gemstone Name : Natural red coral Number of Pieces: 1 Pc Weight: 2.64 carat Gem Shape: o.. Product Description Gemstone Name : Natural red coral Number of Pieces: 1 Pc Weight: 2.68 carat Gem Shape: o.. Description Gemstone Name : Natural red coral Number of Pieces: 1 Pc Weight: 2.69 carat Gem Shape: &nbs.. Description Gemstone Name : Natural red coral Number of Pieces: 1 Pc Weight: 2.71 carat Gem Shape: &nbs.. Description Gemstone Name : Natural red coral Number of Pieces: 1 Pc Weight: 2.75 carat Gem Shape: &nbs.. Product Description Gemstone Name : Natural red coral Number of Pieces: 1 Pc Weight: 2.76 carat Gem Shape: o.. Description Gemstone Name : Natural red coral Number of Pieces: 1 Pc Weight: 2.83 carat Gem Shape: &nbs.. Description Gemstone Name : Natural red coral Number of Pieces: 1 Pc Weight: 2.87 carat Gem Shape: &nbs.. Description Gemstone Name : Natural red coral Number of Pieces: 1 Pc Weight: 2.88 carat Gem Shape: &nbs.. Product Description Gemstone Name : Natural red coral Number of Pieces: 1 Pc Weight: 2.91 carat Gem Shape: o.. Product Description Gemstone Name : Natural red coral Number of Pieces: 1 Pc Weight: 2.93 carat Gem Shape: T.. Description Gemstone Name : Natural red coral Number of Pieces: 1 Pc Weight: 2.93 carat Gem Shape: &nbs.. Product Description Gemstone Name : Natural red coral Number of Pieces: 1 Pc Weight: 2.94 carat Gem Shape: o.. Product Description Gemstone Name : Natural red coral Number of Pieces: 1 Pc Weight: 2.95 carat Gem Shape: T.. Product Description Gemstone Name : Natural red coral Number of Pieces: 1 Pc Weight: 2.95 carat Gem Shape: o.. Product Description Gemstone Name : Natural red coral Number of Pieces: 1 Pc Weight: 2.97 carat Gem Shape: o.. Description Gemstone Name : Natural red coral Number of Pieces: 1 Pc Weight: 3.17 carat Gem Shape: &nbs.. Description Gemstone Name : Natural red coral Number of Pieces: 1 Pc Weight: 3.34 carat Gem Shape: &nbs.. Description Gemstone Name : Natural red coral Number of Pieces: 1 Pc Weight: 3.38 carat Gem Shape: &nbs.. Product Description Gemstone Name : Natural red coral Number of Pieces: 1 Pc Weight: 3.45 carat Gem Shape: T.. Product Description Gemstone Name : Natural red coral Number of Pieces: 1 Pc Weight: 3.48 carat Gem Shape: T.. Description Gemstone Name : Natural red coral Number of Pieces: 1 Pc Weight: 3.56 carat Gem Shape: Tri.. Description Gemstone Name : Natural red coral Number of Pieces: 1 Pc Weight: 3.57 carat Gem Shape: Tri.. Description Gemstone Name : Natural red coral Number of Pieces: 1 Pc Weight: 3.60 carat Gem Shape: Tri.. Description Gemstone Name : Natural red coral Number of Pieces: 1 Pc Weight: 3.61 carat Gem Shape: &nbs.. Description Gemstone Name : Natural red coral Number of Pieces: 1 Pc Weight: 3.64 carat Gem Shape: Tri.. Description Gemstone Name : Natural red coral Number of Pieces: 1 Pc Weight: 3.68 carat Gem Shape: Tri.. Description Gemstone Name : Natural red coral Number of Pieces: 1 Pc Weight: 3.77 carat Gem Shape: Tri.. Product Description Gemstone Name : Natural red coral Number of Pieces: 1 Pc Weight: 3.80 carat Gem Shape: o.. Description Gemstone Name : Natural red coral Number of Pieces: 1 Pc Weight: 3.80 carat Gem Shape: Tri.. Description Gemstone Name : Natural red coral Number of Pieces: 1 Pc Weight: 3.82 carat Gem Shape: &nbs.. Product Description Gemstone Name : Natural red coral Number of Pieces: 1 Pc Weight: 3.83 carat Gem Shape: o.. Product Description Gemstone Name : Natural red coral Number of Pieces: 1 Pc Weight: 3.94 carat Gem Shape: o.. Description Gemstone Name : Natural red coral Number of Pieces: 1 Pc Weight: 4.04 carat Gem Shape: &nbs.. Description Gemstone Name : Natural red coral Number of Pieces: 1 Pc Weight: 4.08 carat Gem Shape: Tri.. Description Gemstone Name : Natural red coral Number of Pieces: 1 Pc Weight: 4.10 carat Gem Shape: Tri.. Description Gemstone Name : Natural red coral Number of Pieces: 1 Pc Weight: 4.10 carat Gem Shape: &nbs.. Description Gemstone Name : Natural red coral Number of Pieces: 1 Pc Weight: 4.17 carat Gem Shape: Tri.. Product Description Gemstone Name : Natural red coral Number of Pieces: 1 Pc Weight: 4.20 carat Gem Shape: o.. Description Gemstone Name : Natural red coral Number of Pieces: 1 Pc Weight: 4.20 carat Gem Shape: &nbs.. Product Description Gemstone Name : Natural red coral Number of Pieces: 1 Pc Weight: 4.21 ct Gem Shape: oval..